Jewish Artists Collective of Chicago (JACC) is a community of multidisciplinary artists connected through common heritage and committed to sharing ideas, enriching practices, and creating dialogue with community. 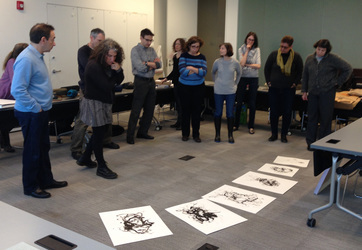 Jewish Artists Collective Chicago began as a group of twelve local artists selected by the Spertus Institute in Chicago to participate in the regional Midwest Artists Lab. The year-long residency included sessions of study with noted scholars, access to the Spertus Institute archives of art, artifacts and library, as well as critiques of our artistic process. The residency culminated in a group exhibition at the Spertus Institute around the theme of wisdom, which was diversely interpreted in both media and conception.